As is the tradition, the release of Koi no Owari Sangenjaya also included the opportunity to pre-order CDs via chara-ani. And much like the 48-groups, the chara-ani application included tickets to a 2-shot event at the corporate office of Tokuma, the label Wasamin records for. Although it is billed as a “chara-ani” exclusive event, they have almost always made “on the day” tickets available for anyone who either wanted more tickets, or didn’t get tickets via the pre-order. 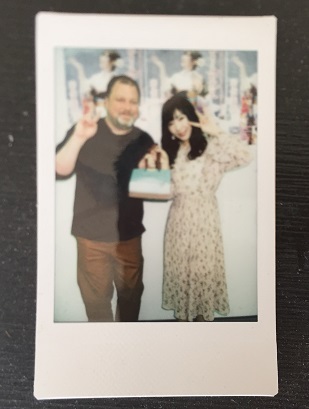 This was especially good news for a friend of mine who had flown into town this past week and wanted to see Wasamin. I purchased three tickets via chara-ani (one for each of the three slots) and would buy more at the venue. The office is a bit of a challenge to find if you have never been there before, in a generic-looking office building between Gotanda and Osaki Stations. I arrived at 11:30, just after the beginning of slot one with my special Wasamin present in tow. 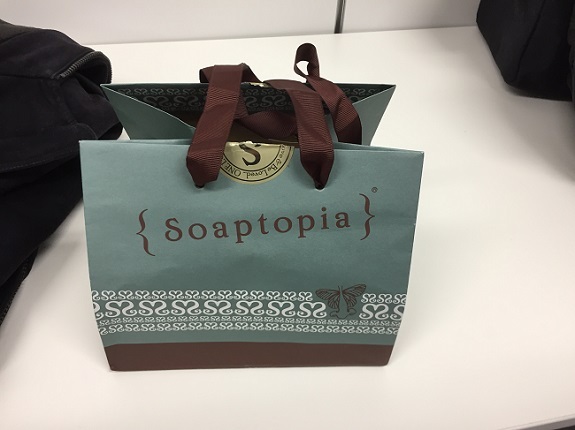 Oh yeah, since White Day had just occurred I decided to pick up a gift for Wasamin, a bath salt set from Soaptopia. I asked her if it was a new dress, after nodding she asked if I liked it. I told her I really liked the collar, but I didn’t know the word for collar. She responded “The ribbon?” Well yeah, that too, but then I said her collar was like a choker, which I think looks cute. 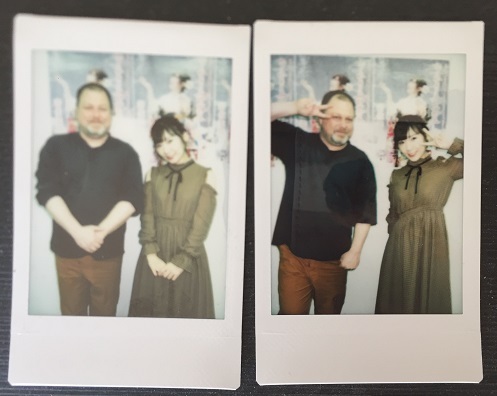 I looped back around for my second cheki, and this time I asked her if it was the soap or bath salts that she liked better from the Christmas gift. She thought about it for a second before saying the salts, which had me totally relieved since I would’ve bought her soap if I thought she liked them best. Although admittedly she y have been saying that to spare my feelings. I had two tickets for the last slot, and in the meantime I hung out at the local Tully’s where I would meet my friend. He arrived right on time at 3 p.m., so we headed back to the event. It was 3:10 when we got back, and they hadn’t yet re-opened the offices, so many of the fans were milling around outside. Eventually we were let in and sent up to the 3rd floor. I was very happy to be presenting a friend to her, plus the fact that I gave her a gift. I was a very good Wasa-fan on this day. Nobody was really pre-queing, most of the fans merely wandering around the waiting area where they were playing “Koi no Owari Sangenjaya” on a loop. 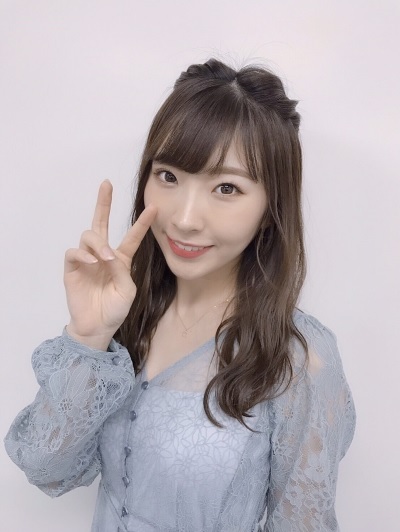 (In the handshake room they were playing all the different versions of the CD) Wasamin had her hair back down and was wearing a transparent blue dress with a white outfit underneath. She immediately asked me which dress I liked the best. I thought about it for a second, and told her the one she was presently wearing. That’s kind of a loaded question, but I had already told her I liked the previous outfit, so it was cool. We immediately queued up for our final tickets, this time my friend going first. During his turn he was telling her about singing karaoke, and that he was recently singing some of her songs. 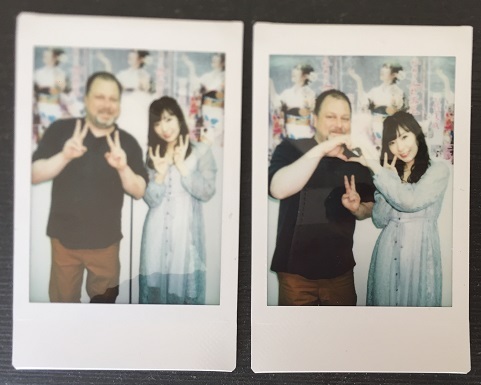 At one point he was mentioning that something was easy, but he didn’t know the word, so I yelled “Kantan!” into the room, which got Sasou-san (Wasamin’s assistant, who was taking the chekis) laughing for a moment. He was like “Ah, Naruhodou!” When my turn came, I was running out of things to say, so I decided to tell her about what happened to me and my friend in Ueno the day before. We were walking outside the station looking for a pub when we were approached by a TV Asahi camera crew. As expected, they were asking us questions about Japanese cuisine, although I don’t think we were their ideal people since I think they were looking for people who say things like “I ate sushi for the first time!” or “Why do you use chopsticks instead of a knife and fork?” They also asked us which restaurants were our favorites. 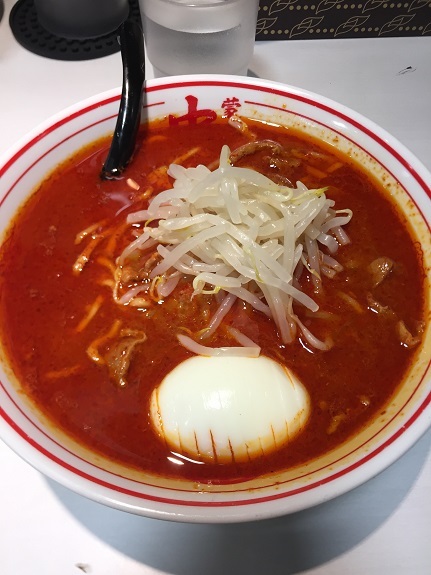 Wasamin asked me what my response was, so I told her that lately I had been eating Mouko Tanmen Nakamoto, which is a pretty famous ramen known for their spicy dishes. Moreover, I told her that last week I had finally tried their hottest dish on the menu. After Wasamin, Ichikawa-san, and Sasou all gasped (“Ehhh?”), Wasamin asked what I thought (It was too spicy!) and confirmed “But you like spicy food, right?” Yes! While I told her the 9-kara ramen at Mouko Tanmen is much too hot for me, I can eat the 8-kara with no problem. Not to mention I go to Akakara Nabe (another known spicy restaurant chain) all the time. She asked my which spice level I get at Akakara. When I replied “5-ban” Wasamin excitedly said that’s the same spice level she gets at Akakara. Hmm, just more evidence that we are soulmates, I guess. Wasamin doesn’t have much local stuff on her schedule right now, I lot of stuff out of town. So I hope she has some new events added to her schedule soon. I get lonely when I don’t see her for a while.